As well as a mass of interesting art from various artists, the event I went to over the weekend also had a massive children’s section housed in one of the old wartime underground barracks. I always enjoy looking at children’s art – it can have less bounds and sometimes a simplistic yet sensible look at the work around us. Probably not today’s piece. I once again failed to record who or which local school made ‘Book Heads’, but it caught my eye for two reasons. The main reason was the amazing filtered light that was cast upon its pages. We were underground with minimal lighting, but above this piece was a small ground level window. 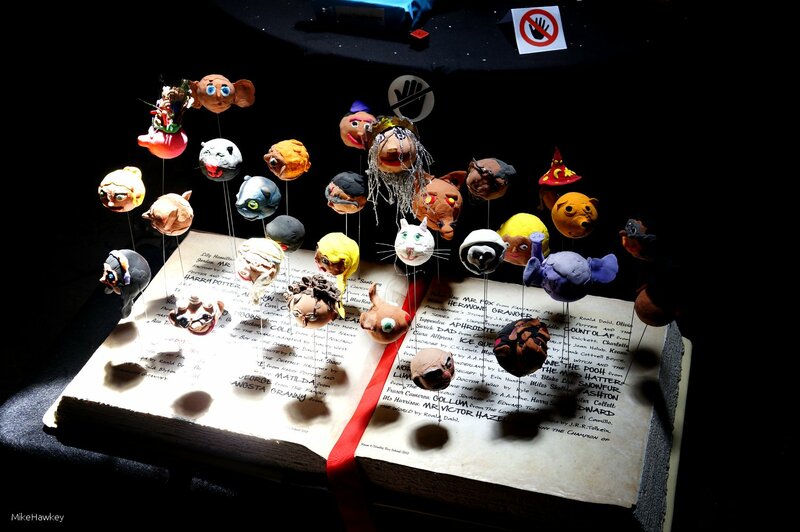 Secondly, I just loved all the work that had gone into creating the heads of various characters from well know books. See who you can spot that you might recognise! Thank you for sharing. I’ve bookmarked this page because I think I might use this idea in some of my art classes in conjunction with the reading program The Forest of Reading. What a great idea. I think the kids will love it. No problem. It is a good idea. Hope it goes well!